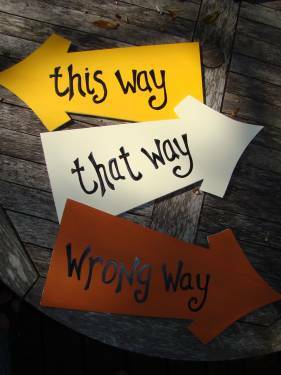 Do You Suffer From Directional Confusion? Everyday we wake up and have decisions to make about our business. There is information coming at us at what can feel like 100mph. With questions to answer, reports to generate, invoices to send, meetings to hold, and phone calls to make, it is easy to suffer from directional confusion. Most business owners know where they want to go, but they may not know how they are going to get there while still generating revenue. The fear of the unknown can lead to not knowing the right course (or direction) to take. This happens a lot and can be detrimental to the sustainability of a successful business or the growth of an up and coming business. A solution to directional confusion can be minimized by working with a team that can keep you organized and on track. Going it alone can be a recipe for disaster. Having a virtual team as part of your business plan and moving you and your business in the RIGHT direction could be the solution you are searching for. This entry was posted in Blog on March 4, 2015 by Assistant Match.